Top: "A Glimpse of New York's Dry Goods District," c. 1886. Library of Congress. Bottom left: Invoice, Heidelberg, Wolff & Co. Makers of Suits, Overcoats & Summer Clothing, 644 & 646 Broadway. Courtesy of Avery Architectural and Fine Arts Library, Columbia University in the City of New York. 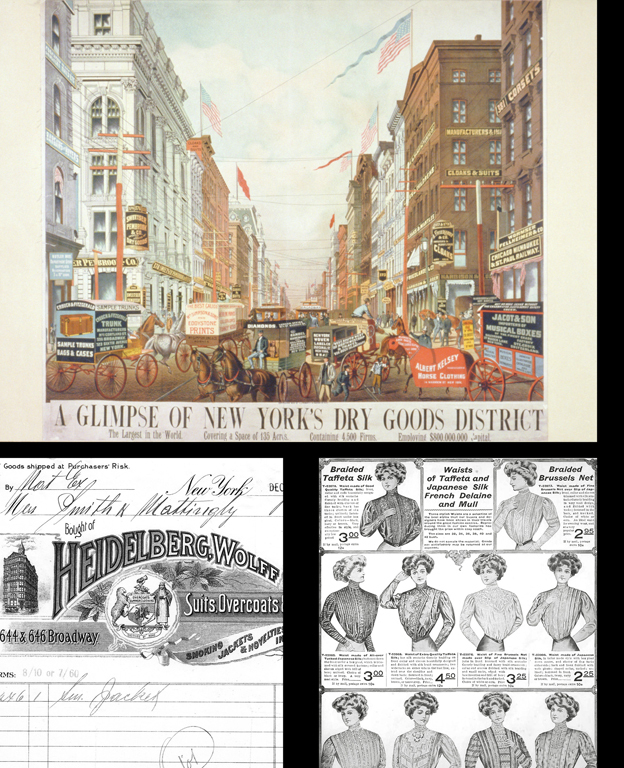 Bottom right: Advertisement for shirtwaist blouses. Eaton's Fall and Winter Catalogue, 1909-10. Toronto Reference Library, Toronto Public Library. We now take for granted that we can go to a department store or boutique and buy clothing in just the size we need. Ready-made clothing is, however, a product of the industrial revolution of the 19th century. Until the mid-19th century, garments were sewn by hand for an individual, be it a simple wool shirt or an elegant gown. But the mass manufacture of the sewing machine beginning in the 1850s changed everything. Men's clothing was the first to be industrialized since fashions in menswear remained fairly consistent for long periods and thus could be easily adapted to mass production. Although New York was an important center for the men's clothing industry, other cities, notably Chicago, Philadelphia, Rochester, and San Francisco, were competitors. Mass production of fashionable women's clothing occurred more slowly, since a factory producing women's wear had to be able to quickly adapt to meet changes in fashion. By 1900, almost all of the clothing worn by American women was manufactured in factories, with most of this work taking place in New York. The dominance of mass-produced clothing went hand-in-hand with the development of department and dry goods stores in cities and towns across the United States in the second half of the 19th century. These retail establishments specialized in the sale of industrially- made goods, marketing New York's ready-to-wear clothing lines to eager consumers.